Hawaii is a 1966 American film directed by George Roy Hill and based on the novel of the same name by James A. Michener. 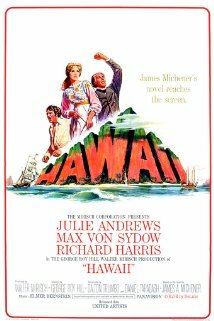 It tells the story of an 1820s Yale University divinity student (Max von Sydow) who, accompanied by his new bride (Julie Andrews), becomes a Calvinist missionary in the Hawaiian Islands. It was filmed at Old Sturbridge Village, in Sturbridge, Massachusetts, and on the island of Oahu in Hawaii.